Welcome to my personal website and blog! The figure on the right is called the Fano Plane. 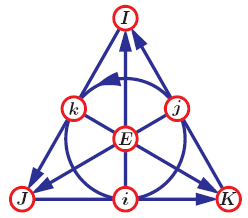 In this case it’s a particular representation of a kind of numbers called octonions. I’ll probably be talking about them here or there, but please don’t wait for me to satiate your curiosity! My blog posts are intended to be a loose mix of personal ramblings and nascent ideas that come up in my daily work as an aspiring mathematician. Hopefully, you find something interesting or even useful within. Enjoy with caution! Questions? Comments? Have a bone to pick? Check out my Contact page and get in touch with me via email.